I got the pillow cases for fifty cents from the thrift store. I put the pillow cases in my fabric stash, thinking I would use it for something someday. Well, today was the day! and then cut 9" by 9" squares out of the pillow case fabric. I used some of the scraps to make loops for hanging. 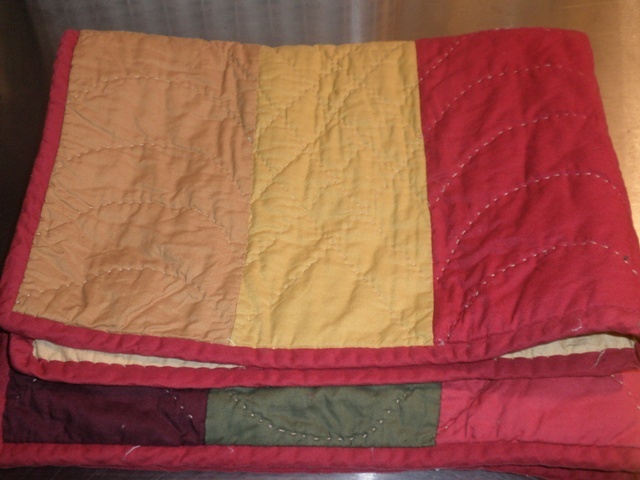 I used some old baby blankets from my stash for filler. 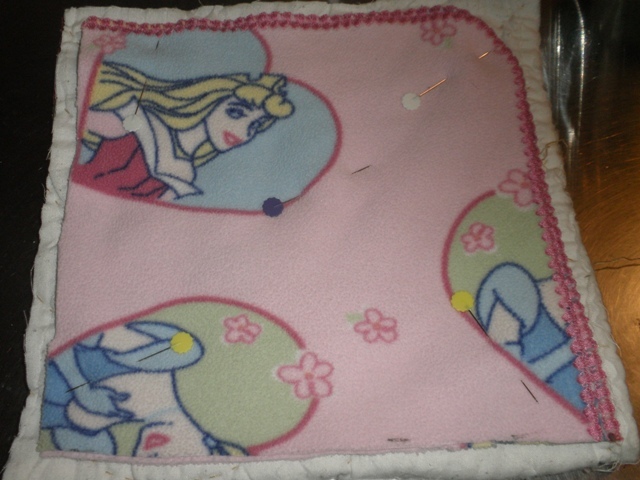 Sewing with good sides facing in. Voila! Six pot holders for fifty cents! We Use This For That! 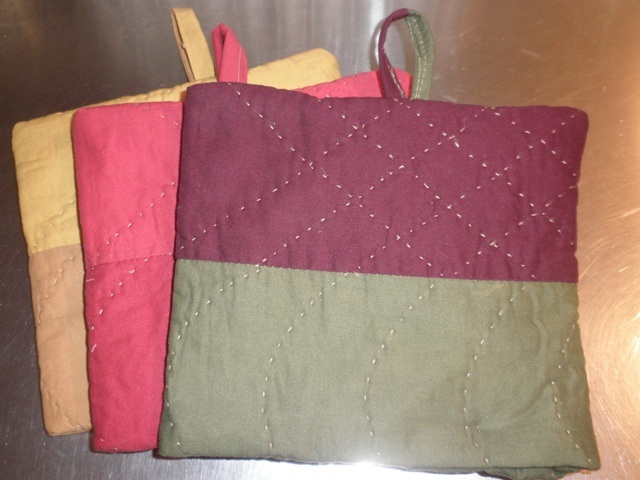 For almost all of my sewing projects, I use recycled or re-purposed fabrics. I buy sheets, curtains, tablecloths, pillow cases, extra large dresses etc. from garage sales and thrift stores. The "fabric" goes in my fabric stash in my closet. 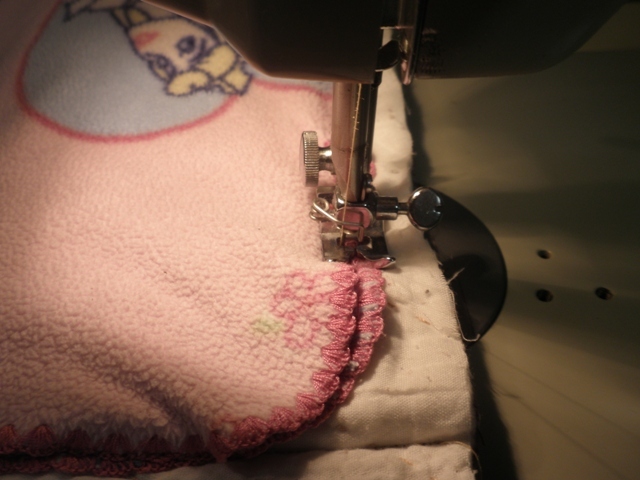 Whenever I am getting ready to start a sewing project the first thing I do is trim the fabric, take off all of the buttons and zippers; this is time consuming but a good rate per hour since I get yards of fabric for my time. 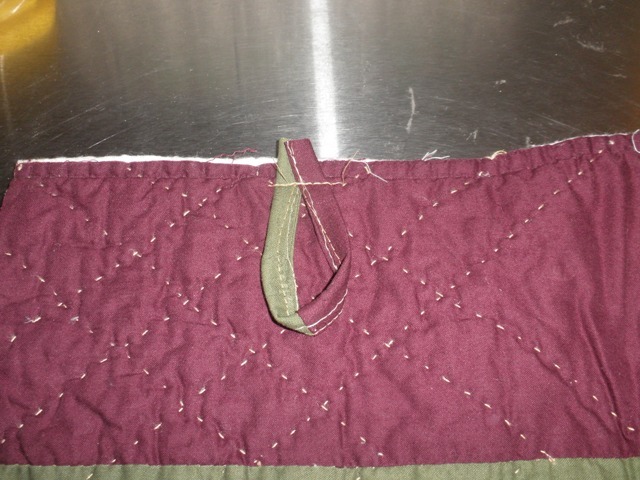 For example, if it is a fitted sheet, I cut off all of the elastic around the edges. 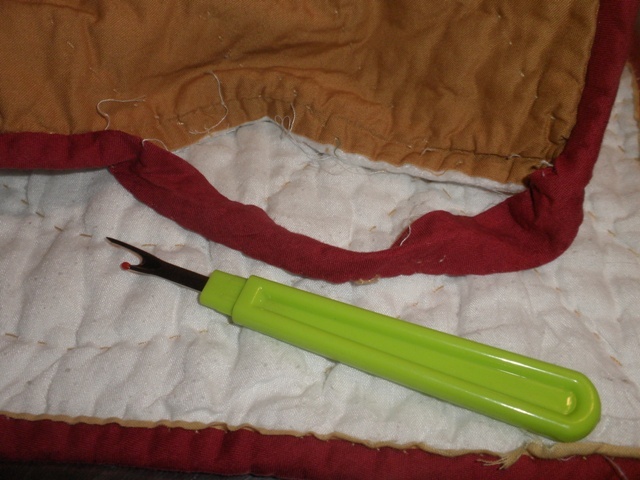 I also trim off binding from blankets, as pictured below. ...I actually use my fabric balls. 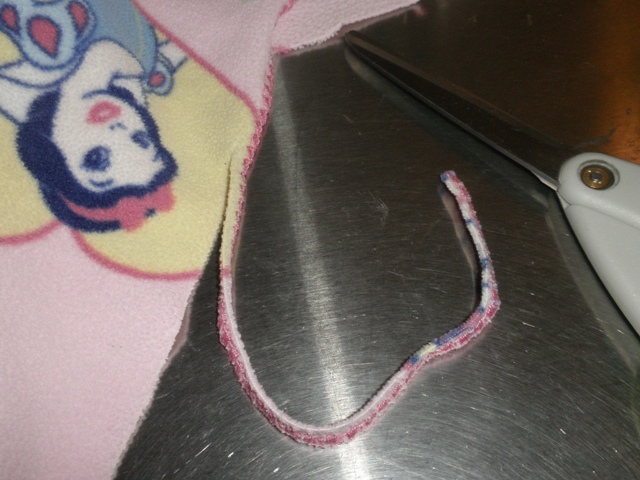 I use the strips of fabric like string, only it is heavy duty string. I use the string for holding sleeping bags that are rolled up, tying egg cartons together for storage, tying old sheet covers on our van seats that are stored in the barn---just about anything you would need heavy string for. One visiting child even used a stretch of string for an emergency belt! If the piece of string isn't long enough for what I need, I just tie it together with the next piece on the ball. 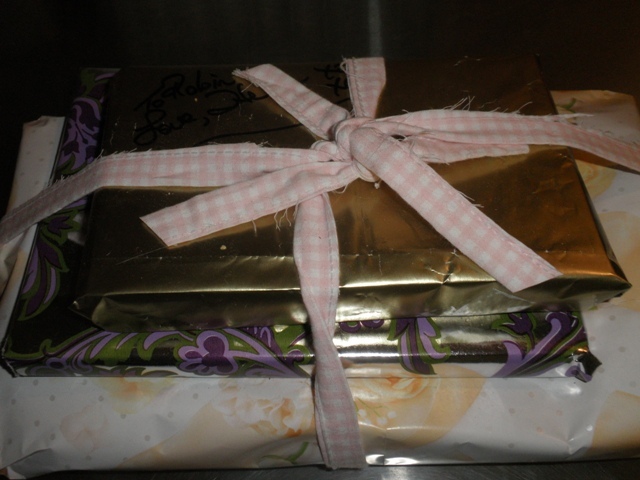 Using the string as ribbon for gifts. 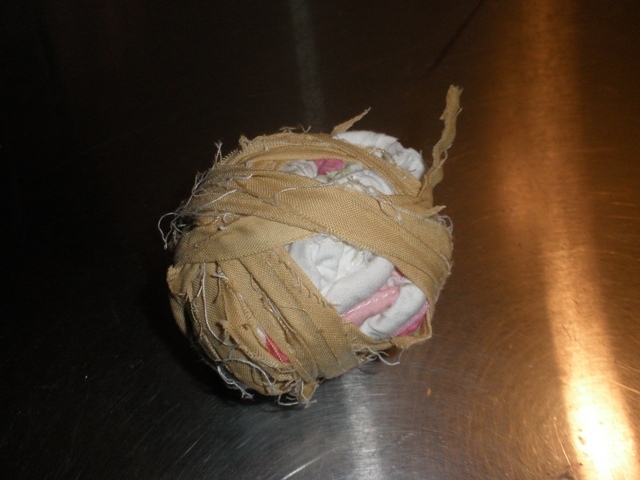 Even if you don't sew new things out of re-purposed fabric, you can still collect fabric balls and always have this "string" on hand when you need it. When you have old clothes, sheets, curtains, etc., that are stained and ready to be trashed (for me that means not good enough to give to the Goodwill), go ahead and cut them up. 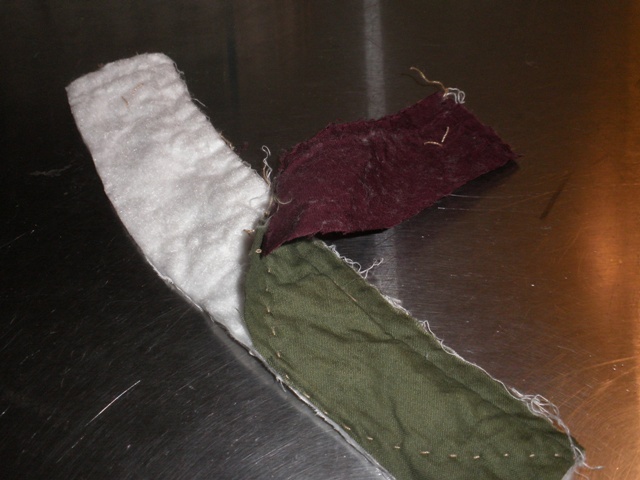 Kids can even tear the fabric into strips for you and roll them into balls. Don't be surprised if they have a ball fight at the same time! If you get really adventurous you can make a rag rug with the "string". 'Beka teaching my niece to make a rag rug. The severe drought continues to take it toll here in the mid-west. To keep from closing our doors on our store, we have had to raise our prices this year. Most of the farmer's corn around us is expected to be lost for the year. When you see the acres and acres of corn around us, it makes you want to weep. This is a terrible loss for the farmers around us and the country. Expect your grocery bill to reflect this loss by next summer! Animal feed costs will also rise over the coming months. We are doing everything we can to keep those costs down. Gerald had an ingenious idea to make silage out of our corn. It took the better part of a day with all three guys (Gerald, Tim and Caleb) working on it. We will feed this silage to the two calves during the winter. 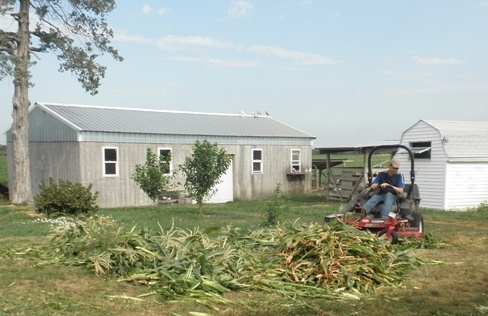 First they cut down the stalks. 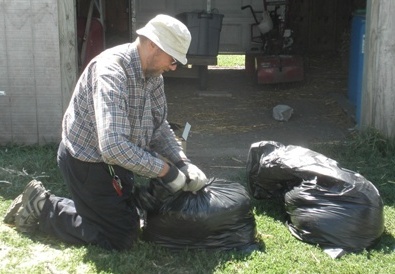 Then Tim mowed and bagged them in the mower bagger. 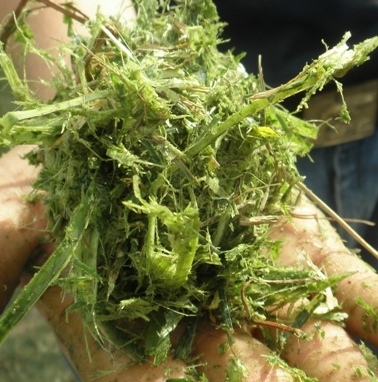 This is what the silage looks like. Gerald bagging up the silage. They did up a total of 18 bags. 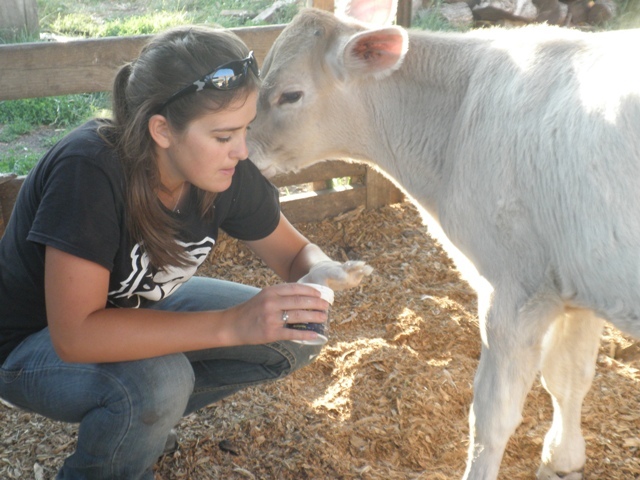 'Beka loves working with the calves. 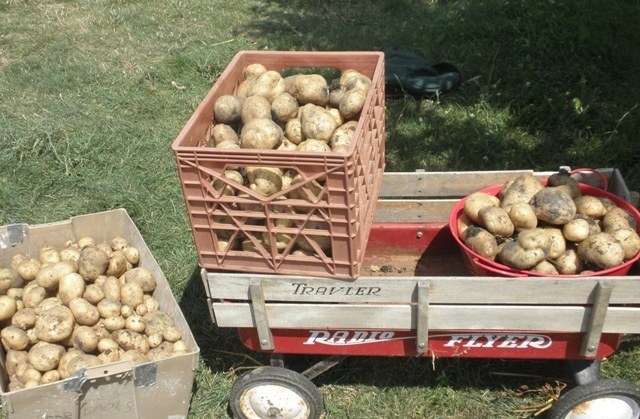 We dug the entire potato crop in one morning---this was hard work! We always celebrate the final potato dig by taking the family out to the Dairy Queen. Always enjoyed and always appreciated by our hard working gang on the farm. 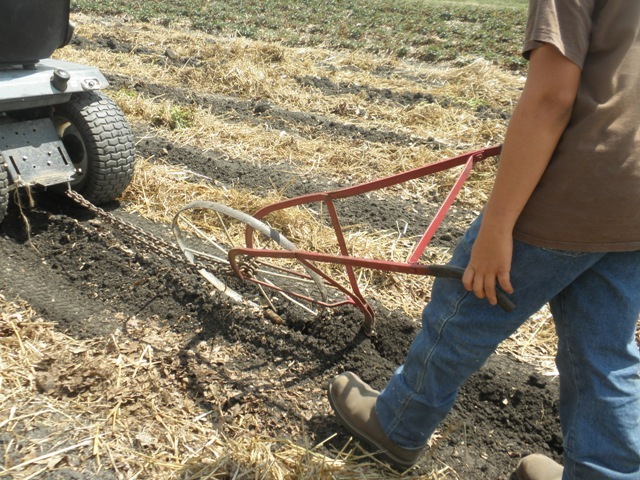 Using our wheelhoe to "dig" the potatoes. We brought in about five loads like this. 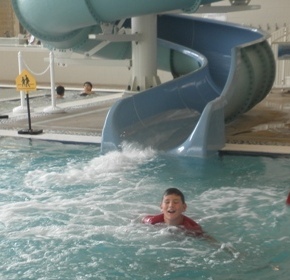 Friends treated us to a full day at the new YMCA in Champaign! It was great fun! 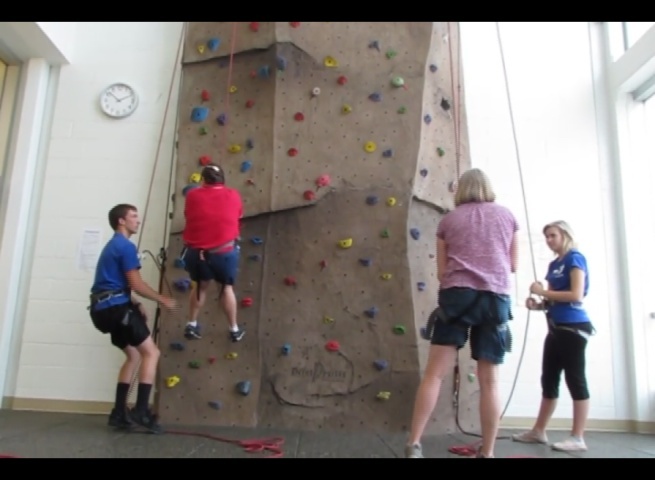 The kids had a blast on the climbing wall. 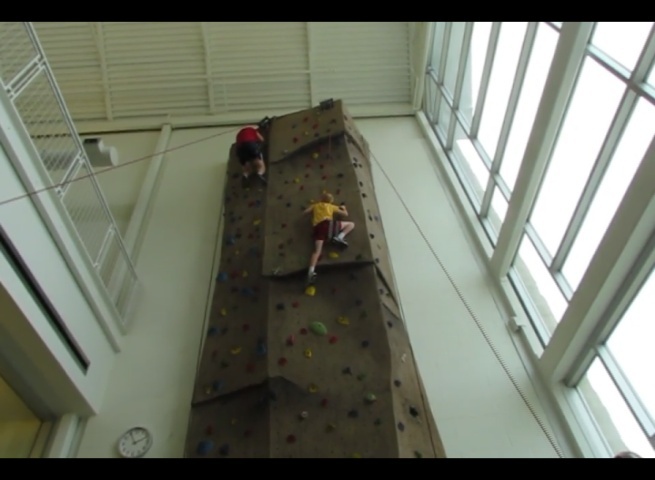 I dared my friend (46 years old) to go up the 25 foot repelling thingy climbing wall. I thought she would decline, but she didn't. Oh my! So up we went. I was a little worried about the ropes, but the teenager that worked the ropes told me not to worry because the ropes could hold 5,000 pounds. I know he meant to reassure me. I didn't dare ask him what exactly he meant by that since he was holding the ropes! Note that I am 58 years old and.....insane! A few tips from the instructor. I'm on the left in red. 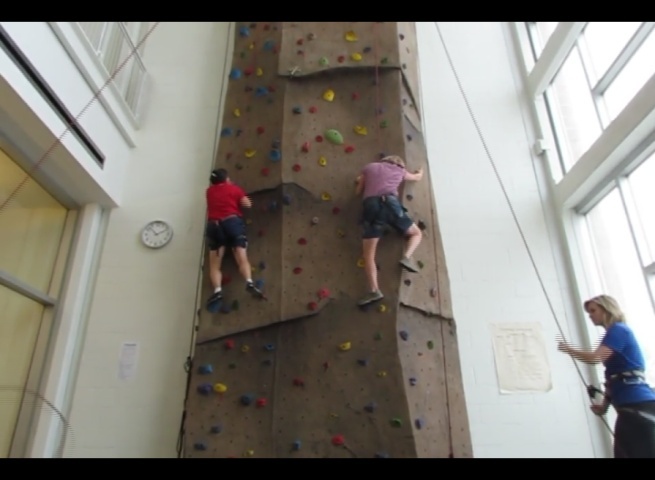 I rang the bell at the top, repelled down and lived to tell about it! Our last contest was a hit! Thank you to the many readers who responded! The answer to the last contest question was "Mr. McGregor" of Peter Rabbit by Beatrix Potter. The winner responded within minutes of my posting! Congratulations to our winner who received a nice big bunch of stickers! With school just around the corner, we are offering 50% off on either a Dr. Aardsma's Spelling Drill or Dr. Aardsma's Math Drill. A savings of $8.47! Dr. Aardsma's Math Drills and Dr. Aardsma's Spelling Drills are being used around the world to improve math and spelling skills. To receive 50% off on Dr. Aardsma's Math Drill or Dr. Aardsma's Spelling Drill, simply send an email to sales@DrAardsmasDrills.com and put "50% off sale" in the subject line. Let your friends know about this great sale! Hurry! Sale ends August 8th, 2012 at 12:00 midnight.